Mushroom picking in Finland is a popular hobby and even an income for some. It is allowed by everyman’s rights, and Finland really is mushroom picker’s paradise. There are thousands of types of mushroom and few hundred of those are edible. 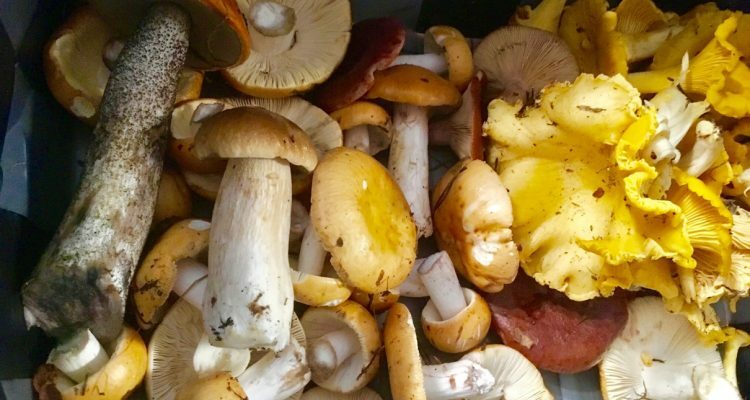 Most of the edible mushrooms are collected from end of August to October. Mushrooms mainly grow in forests, but they can also be found in parks, fields and roadsides. Many Finns avoid picking mushrooms from the side of the roads as the mushrooms absorb heavy metals from pollution. 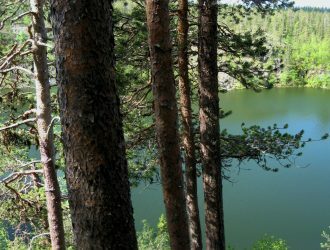 Many travel companies organize berry or mushroom picking excursions. They are ideal for beginners to avoid getting lost in the wilderness or accidentally picking something poisonous – and even deadly. 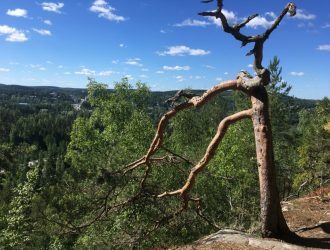 There are about 60 species of toxic wild mushrooms growing in Finland. 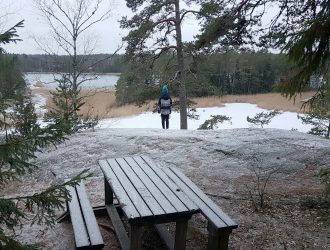 Many foreigners are used to white mushrooms being tasty in their home countries as champignons, but while some white mushrooms are edible and tasty also in Finnish forests (such as sheep polypores), the most poisonous ones are also white. I would advise people to stick to what they know to be edible for sure and only pick the more difficult types with some specialist who can safely identify them. Whenever a mushroom cannot be identified with an absolute certainty, it must not be eaten. It is recommended to keep different types of mushrooms separately in the basket, especially if you are unsure about them and want to check them more carefully at home. Disorientation is also a common danger as you are looking for mushrooms and walking after them without paying so much attention to your whereabouts. 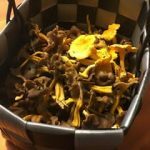 What mushrooms to look for in Finland? Mushroom season can start as early as May when the first mushrooms begin to emerge. The delicious but toxic false morels are first comers and can be found especially in Lapland. The false morels often grow in sandy forest beds, where the ground has been disturbed, like on side of the dirt road. 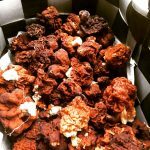 The false morels need to be boiled twice before they are edible, and they can smell pretty bad during that process. But they are considered delicacy and many restaurants serve highly valued false morels in risottos, sauces, stews and soups. Chanterelles can be found at the end of the summer or early autumn. They are distinguished by their yellow colouring and funnel shape. Chanterelles are not easily mixed with poisonous mushrooms, and they are usually the first type of mushrooms that beginners learn to pick. There is one similar looking species, the false chanterelle, but it is more orange than yellow and often straight and round, unlike chanterelles. Hedgehog mushrooms remind of chanterelles in color but they are recognizable from their spines rather than gills, which hang down from the underside of the cap. Chanterelles are very versatile but they are especially delicious when fried fresh in butter. And they are loaded with vitamin D. Chanterelles can be frozen, but they become rubbery if dried. 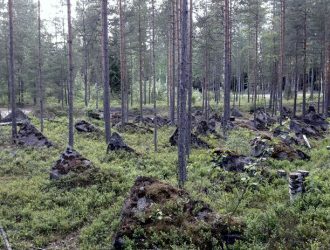 Birch forest is a common habitat for the chanterelles as in Finland they grow near birch roots. Chanterelles also like moist and mossy undergrowth. The funnel chanterelles (pictured with chanterelles) show up later than most species and can usually be found in large populations. There are few similar looking species, but funnel chanterelles can be recognized also by their likable smell. 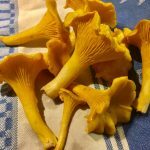 Picking funnel chanterelles is the most fun you can have in the Finnish forests in the autumn. At first they are difficult to spot as they are brown, but when you start finding them, you easily get your basket full. Luckily the funnel chanterelles can be frozen or dried, and used later for pies, soups, stews, pizzas and many other mushroom dishes. 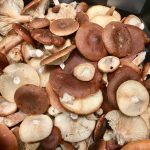 Boletes are considered as some of Finland’s finest and most delicious mushrooms. Boletes have round caps and small pores rather than gills underneath their caps. Some species of boletes are poisonous. The orange birch bolete has an orange colored cap and long, thin stem. It is typically found in birch forests. There are few similar species such as foxy boletes, which can be found near pine trees. 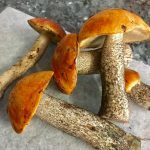 The orange birch boletes and foxy boletes are delicious when cooked fresh, but they can also be dried. One of the most valued species of boletes is penny-bun. It has light or dark brown, fleshy cap and thick stem. The flesh of the penny-bun is firm, nutty and mild, and always pure white. Its outstanding flavour and wonderful aroma make it extremely versatile. The brittlegills (russula) are brightly-coloured and mild-tasting mushrooms. Some of them are very tasty while others are bitter. The mild and edible brittlegills can be identified by tasting them raw (without swallowing). 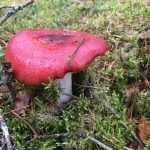 There are numerous edible species in the Finnish forests, for example a tall russula and darkening brittlegill. Brittlegills can be dried or frozen and they are often used in pies and stews. They can be found in pine forests or swamps. Milkcaps are easily identified by the droplets of milky liquid they exude when they are cut. Many milkcaps are toxic and need to be boiled before use. A rufous milkcap grows with pine trees, but can also be found with birch or spruce. It is generally not recommended for consumption, but in Finland many people enjoy this mushroom after it has been boiled and preserved with salt or vinegar and other spices. This mushroom is also used in mushroom salads with mayonnaise, cream and onions. Have you ever been hit with a mushroom madness?